Scientists were baffled last July when they discovered three giant holes in the ground in the Yamal Peninsula in northern Siberia. Now, with the help of satellite imagery, researchers have located four additional craters–and they believe there may be dozens more in the region. That has them calling for an urgent investigation to protect residents living in the area. “I am sure that there are more craters on Yamal, we just need to search for them… I suppose there could be 20 to 30 craters more,” Prof. Vasily Bogoyavlensky, a corresponding member of the Russian Academy of Sciences and deputy director of the Moscow-based Oil and Gas Research Institute, told The Siberian Times. “It is important not to scare people, but to understand that it is a very serious problem and we must research this. Researchers ventured deep inside one of the holes last November, collecting data in an effort to learn why the holes formed. The leading theory is that the holes were created by gas explosions triggered by underground heat or by rising air temperatures associated with climate change, the Siberian Times reported last December. Since scientists can’t predict when or where gas explosions will occur, it’s dangerous to study them, according to Bogoyavlensky. But he said his team is planning to launch a new expedition, and to put stations in the area to detect earthquakes that might strike when the craters open up. Experts in the U.S. echoed that sentiment. Dr. Carolyn Ruppe, a research geophysicist at the Woods Hole Field Center in Massachusetts and chief of the U.S. Geological Survey’s Gas Hydrates Project, told The Huffington Post in an email that she was not surprised that new holes had been found. Ruppel, who is not involved in the Siberian research effort, called for more research on the holes. 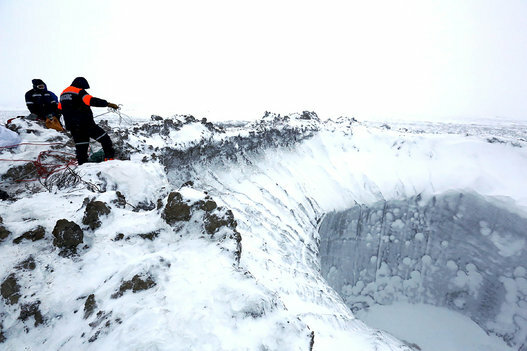 See below for photos from the November’s expedition into one of the craters.